Specialist foot pedals designed for hands-free dictation. Hands-free dictation made simpler with the use of foot pedals. 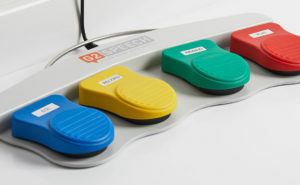 This ergonomic foot pedal has been specifically designed by G2 Speech to meet the demanding pathology environment. The pedal is fully operable with the feet. This allows the user to have both hands free for macroscopic examination. The pedal is waterproof and easy to use. Facilitates all necessary dictation functionalities.